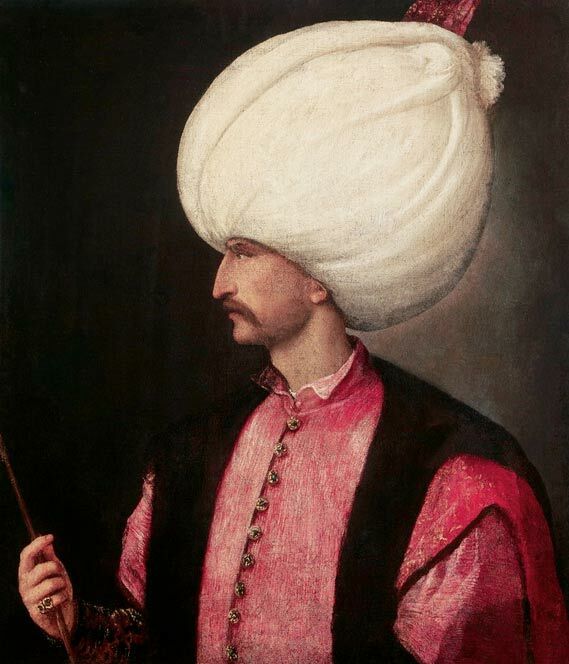 SULEIMAN THE MAGNIFICENT, OTTOMAN SULTAN was born (d. 1566); the tenth and longest‐serving Sultan of the Ottoman Empire, reigning from 1520 to 1566. He is known in the West as Suleiman the Magnificent and in the Islamic world, as the Lawgiver (in Turkish Kamuni; Arabic:, al-Qanuni), deriving from his complete reconstruction of the Ottoman legal system. Within the empire, Suleiman was known as a fair ruler and an opponent of corruption. Historians claim that Suleiman, in his youth, had an admiration for Alexander the Great as he wanted very much to learn how he had managed to unite the peoples of the east and the west. Pargali Ibrahm Pasha was the boyhood friend of Suleiman. Ibrahim was originally Greek Orthodox and when young was educated at the Palace School as a devshirme (the systematic abduction of young boys from conquered Christians lands by the Ottomann sultans as a form of regular taxation in order to build a loyal slave army). As the Sultan’s male favorite, he shared Suleiman’s quarters and his tent while at home and on campaign. Suleiman made him the royal falconer, then promoted him to first officer of the Royal Bedchamber. Eventually, Ibrahim Pasha became the Grand Vizier in 1523 and commander in chief of all the armies. Suleiman also conferred upon Ibrahim pasha the honor of beylerbey of Rumelia, granting Ibrahim authority over all Turkish territories in Europe, as well as command of troops residing within them at times of war. According to a 17th century chronicler, Ibrahim had asked Suleiman not to promote him to such high positions, fearing for his safety, to which Suleiman replied that under his reign no matter what the circumstance, Ibrahim would never be put to death. Ibrahim would eventually fall from grace with the Sultan. During his thirteen years as Grand Vizier, his rapid rise to power and vast accumulation of wealth had made Ibrahim many enemies among the Sultan’s court. Reports had reached the Sultan of Ibrahim’s imprudence committed during a campaign against the Persian Safavid empire, in particular his adoption of the title serasker sultan was seen as a grave affront to Suleiman. Suleiman’s suspicion of Ibrahim was worsened in a quarrel between the latter and the Minister of Finance Iskender Chelebi. The dispute ended in the disgrace of Chelebi on charges intrigues against the Sultan, with Ibrahim convincing Suleiman to sentence the Minister to death. Before his death however, Chelebi’s last words were to accuse Ibrahim of conspiracy against the Sultan. Since these were his dying words, Suleiman became convinced of Ibrahim’s disloyalty and on March 15, 1536, Ibrahim’s lifeless body was discovered in the Topkapi palace.